Welcome to Evolution Home Theater! 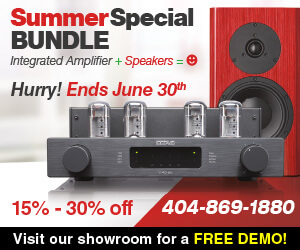 We are Atlanta's leading audio-video specialist with showrooms open to the public in Buckhead. We are celebrating 52-years as a family-owned business and are proud to offer our clients the best brands and most experienced staff in Georgia. Evolution Home Theater is the leader in quality audio systems, home theater, home automation, the installation of structured wiring, whole-house music, lighting & climate control, and more. We insist on staying on the cutting edge of technology while meeting the ever changing needs of our customers. We recognize the special care and attention to detail needed when building your dream home or designing your ultimate audio system. Evolution Home Theater is now Atlanta's Dynaudio Loudspeaker dealer. We are extremely excited about this Danish brand of loudspeakers, with models in all price ranges, from very affordable to state-of-the-art. You HAVE to drop in to hear the Dynaudio Special-40's - this model is one of the best values we've ever seen from a speaker! They are only $3000.00 per pair - but you would think they should cost over double that based on the sound and looks. We are now displaying OCTAVE AUDIO, a remarkable tube-amplifier company from Germany. These are some of the best-engineered, best-built and best sounding tube-amplifiers we've ever seen. The V40-SE model is now on display and you really have to hear how incredible it sounds. It sells for a very affordable $4500.00 but sounds like a million bucks. Pair this with the Dynaudio Special-40 speakers and you'll have a system that you would be thrilled with for decades. Evolution Home Theater is now a dealer AURALiC audio streamers. They are fantastic source components that manage your existing digital music library and stream high-quality audio from Tidal as well. These are "Roon-ready" which means that you have a fantastic menu that is simple to use, looks gorgeous, and and really helps you discover new music and albums. They are surprisingly affordable as well. Please come to learn more about these, you'll be glad you did. We've just returned from the Munich High-End show, and it was an incredible experience. There were an overwhelming number of exhibitors there, and we've sorted and auditioned many of them. We intend to bring in some utterly fantastic new lines of product into our showroom, some of which have never been seen before in the United States. Please stay posted for new information in the next couple of months. I promise you that we'll have some every exciting new audio products that you'll want to experience and know about. Evolution Home Theater is now proudly displaying European Audio Technology (E.A.T) turntable. We think these are extremely high-performing vinyl spinners at very reasonable pricing. We are also now a dealer for Okki Nokki Record Cleaning Machines. We are now displaying Autonomics music streamers. Please drop by the showroom for a demonstration! Our B&W 800D Music Listening Event had a fantastic turn-out and everyone had a great time! We will be annouuncing another extremely special event for late July. Please watch for details. This one will be something to remember! It's been an exiting year here at Evolution Home Theater and we have all kinds of new High-End Audio gear! Bowers and Wilkins has redesigned their Diamond-Series speakers from the ground-up and they are very different from their previous versions. We have every model set up and ready to demonstrate so please come by and take a listen! We are now showing the McIntosh MC2301's, some of the best tube-ampliers ever made. They are 300-watt monoblocks and will drive any speaker. They have to be heard to be belived! We also have the MC1.2K monoblocks, at 1200-watts each, the MC601 monoblocks, as well as many others. As a McIntosh Platinum Dealer we have one of the best selections of McIntosh products on display for hundreds of miles. McIntosh has just released their new C1100 preamp, a two-chasis tube model. It's one of the best products McIntosh has ever made in our opinion. Come see for yourself. We are now a Sonus Faber Platinum Dealer. We're extremely excited to be one of a very small number of dealers in the United States displaying the new $45,000 a pair Sonus Faber Il Cremonese. These are stunning speakers to look at, the design and aesthetics are off the charts, and they are a joy to listen to. Join us on Facebook for the latest news and photos! Our beautiful showrooms feature presentations of ultimate movie-going theater experiences as well as state-of-the-art home automation, lighting control, and systems integration demonstrations. Evolution Home Theater is partnered with the best home automation companies in the business. We offer superior lighting control, systems integration, and more! Stop by our Gwinnett Showroom, and experience it for yourself! Everyone loves a deal. Take advantage of our current overstock or close-out specials. We guarantee the best prices on some of the best products on or off the market. We’re proud of our work and would love to share it with you. Since our inception this family business has strived to pamper our clients and exceed their expectations. We’ve been designing and installing custom electronics since 1959.